Cover the bottom of your pot with water. Put in the berries and the sugar. Let it all simmer. Stir it occasionally to prevent burning. When it is almost finished, season to taste with lemon juice. When the bubbles begin to stick together over the entire surface, the jam is finished. If you have a cooking thermometer the temperature of the jam should reach between 217°F and 221°F (103° C and 105° C) when its done. 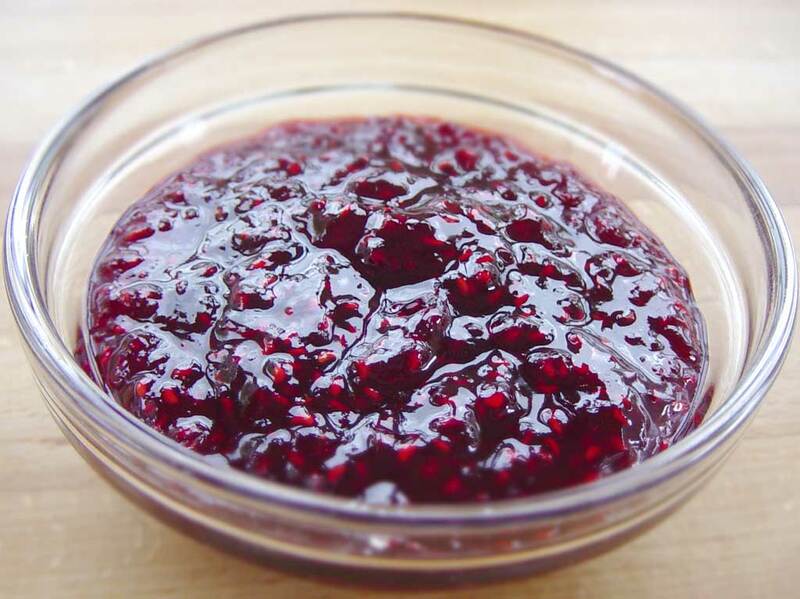 The jam will be better and taste fresher if it simmers at a relatively low temperature. Berries and fruit are a bit sensitive to heat. So it is a good idea to do it in a pan or a large frying pan. Anything with a large surface. That way you can get more evaporation at a lower temperature. But for smaller portions like this one it does not make a lot of difference. So I have just used a regular saucepan. I practically always use frozen fruit for my jam. And it is typically sold in 10 oz (300 gram) bags. That is why the recipe has this odd amount. But it is also a portion that fits well with most cake recipes, jam jars etc. Raspberries breaks down til small pieces by themselves when cooked. Strawberries and other harder fruit I usually chop into quarters to prevent large lumps. The difference between marmalade and jam is hard to define. It is a strange combination of history and food legislation. In denmark there have to be 25% fruit in marmalade and 45% fruit in jam. So jam is the "exclusive luxury" version. The most important reason to make jams and marmalade with a lot of sugar, has traditionally been to preserve the fruit during the winter. But it does also give a taste and consistency that fruit cannot get on its own. Nowadays we mostly do it because of the taste. Marmalade is normally composed of 45% -55% sugar by weight to begin with. That is to say, 1 part sugar to 1 part fruit. If you want a stronger fruit taste you can use 1 part sugar to 2 parts of fruit. But then it will not keep for nearly as long, and you must store it in the fridge. It will still last for weeks though. But it is nice if you need to use a jam in a cake or dessert, that is to be eaten right in a few days, that you can give it a better taste. Jam comes from the Italian word marmelatta that comes from the Portuguese word marmelo, which means quince. It was used on the Greek "melimelon" which is quince jam with honey as sugar and preservative. One of the very first jams. So Greek quince marmalade is actually the mother of the jam we know. How do you store the jam? In Canada it's usually 'canned' in sealed jars and processed in a water bath to seal for a long shelf life. What would be you're recommendation? When you have more than 50% sugar (there is sugar in the fruit too) in a marmelade it is self preserving. As that much sugar is toxic to bacteria and virus. So you don't really need anything. But you can risk it catching some kind of fungus/mold. If you boil the glass and sterilize your equipment the risk is very small. To be absolutely certain though, you will need to add a small amount of preservative to the mix. I cannot help you with Canadian brands, but it should a pretty common ingredient to find in supermarkets.